I have learned my piano piece and I play all of it correctly, the way the composer asked for it to be played. What more is there for me to do? I feel like something is missing. There is an aspect of playing music that I call “the intangibles”. These are the things that happen in your inner world that affect how people in the outer world perceive the music you play. These include things like freedom, attention, confidence, attitude, taking authority, feeling comfortable, and so on. The standout among these is freedom. Freedom means that as you play music, you do whatever you want to do, whenever you want to do it. It means that you drive the music, not the other way around, and that you only play the notes when you feel like it’s the right time to play them. Freedom is what an audience wants to hear. True, hearing someone like Vladimir Horowitz play with breathtaking brilliance is exciting. But, in one sense, what is exciting is not the brilliance; it is hearing someone do whatever they want to do, whenever they want to do it. 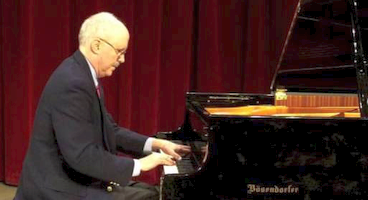 Someone who has captured this quality is equally compelling when playing slow, quiet music. Freedom doesn’t mean that you don’t play the notes as they are written, or that you don’t play in strict time or with precise rhythm. It’s just that when you do, you are freely choosing to do so, as opposed to following the orders given to you by the page or by your metronome. The choice to conform is a free choice. As long as you feel obligated by the page or by your metronome, and as long as you feel like you are trying to keep up with something that is running ahead of you as you play, you aren’t feeling right. And you aren’t free. However, not only should things feel right but they should also be right. Feeling right is inner and subjective; it is about you. Being right is outer and objective; it is about what is on the page. Having one without the other—it feels right but it isn’t right, it is right but it doesn’t feel right—creates an unsatisfying experience. At an early phase of study, the musician’s job is to be right: to identify what is on the page and to render it accurately. That is what you have done with your piano piece, and congratulations on that. The next step for you is to include the aspect of feeling right. How can you take a step in the direction of feeling right? Start by listening to what you are playing. When you are counting beats and planning your next move, you are not listening. How can you start to listen well? One method is to play a single note and listen to it until it fades away. That is the kind of listening that you should do all the time, no matter what you are playing. Sounds have a life of their own. Listen to how they evolve. How can you practice the experience of freedom? One method is to elasticize a piece that you have learned. Play it all out of rhythm, exaggerating and lingering at your every whim. This will show you the extreme possibilities for feeling right without being right. After you have experienced that side of freedom, re-introduce its other side, the side of being right. Play correctly. But retain your sense of freedom as you do.